A captured German machine-gun commemorates the victory of Great Britain and her allies in World War One. This Captured German Gun Was Presented To The Townspeople Of Tottenham By The Military Authorities For The Returned Soldiers League To Commemorate The Victory Of Great Britain And Her Allies During World War 1. It Was Originally Erected On A Foundation Laid For A Pedestal On The Site Of The Original Park In Tottenham At The North End Of Bulbodney Street In May 1925. 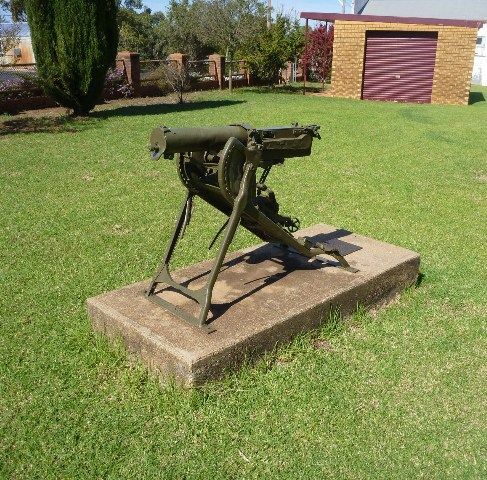 On The 3rd June 1925 Brigadier-General C. Cox (Fighting Charlie) Unveiled The War Memorial Gun. A Bottle Time Capsule Was Laid In The Foundation Pedestal. It Was Raised And Opened On New Year`s Eve 1999 In The Tottenham Memorial Hall At The New Millenium Celebrations.